Equipments base stats and abilities aren't the be all and end all to it. Equipment in Perfect World can be upgraded to improve their base benefits and stats, or make them more versatile. Players can upgrade their equipment via 2 ways in the Perfect World. Those are thru Equipment Refining or Soul Stone Fusion. Infusing equipment with the power of Immortal Stones Increases an equipments base stats. The stat improved depends on the type of equipment refined, while the amount of bonus depends on the level of refinement. Obtain Immortal Stones. If you want to know all the different sources of Immortal Stones please check the Immortal Stone Source Section. Go to any Castellan or Elder of any City to have your item refined, you can read more about this at the Refining Locations section. Wait for Results, you can read about the different results at the Possible Refining Results Section. If you want better chances at refining, you can read about it at the Refining Aids. The Immortal Stones must be in your inventory for you to begin refining equipment. It takes 2 Immortal Stones to refine weapons, while it takes 1 Immortal Stone to refine other pieces of equipment. Drag the desired equipment to be refined unto the window and click on refine. Refine Failed. Refine level unchanged. Refine Failed. Refine level decreased by 1. Refine Failed. Refine level reduced to 0. It becomes more difficult to get successful refinements as the equipments level, quality, and refine level increase. There are however items that can improve your chances for successful equipment refining. 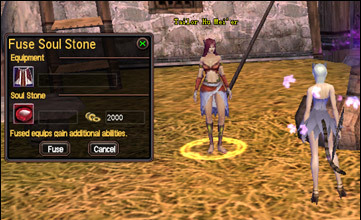 Heaven Stone - This item greatly increases the chance for success. Underworld Stone - This item slightly improves the chance for success, and prevents refine failures which reduce the refine level by more than 1. Dragon Ball - This item can given 100% success in each upgrade depending on the level of the dragonball. Check dragon-balls for more info. 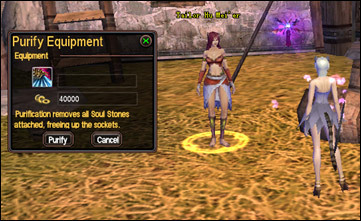 Infusing soul stones into the equipment slots allows the player to increase certain attributes of the equipment depending on the soul stone attached. * Not to be mistaken with crafting jades. *** Soul Stone effect when slotted into armor, accessories, or manteaus. The bonus given by the soul stone effects depends on their levels, with 1 being the lowest and 12 being the highest. Equipment fused with soul stones also gain different special effects, such as glows, ligt trails, etc. The kind of special effects depends on the type, number, and level of soul stone attached. In order to fuse soul stones with equipment, a player only needs the soul stones and slotted equipment. The amount of soul stones which can be fused into a slotted equipment is dependent on the equipment's number of slots. The level of soul stone you can attach should be equal or less than the slotted equipments level (found underneath the equipment name; not to be mistaken with the equipments Lv. requirement). Check soul-stones for more info. Obtain a slotted equipment and the soul stones you wish to use. Head for the required NPC and choose the Soul Stone Fusion option. The ff. window should pop up. Drag the slotted equipment and soul stone into the window, the yuan costs for the fusion should appear, and the click the confirm button. Fusion never fails so there's no need to worry. Repeat the process for other the next soul stones and equipment to be fused together. Should you find yourself with undesired soul stones fused with a slotted equipment, you can have the NPC's remove the attached soul stones through purification. Simply select the purify option with the necessary NPC based on the equipment, and the window below will pop up. Drag the equipment to be purified into the window, then the yuan cost for purification should appear. Click Purify and all the soul stones attached will be destroyed. Purification destroys all attached soul stones and will not return them to your inventory. So before you purify a slotted equipment make sure you really want all the soul stones removed. 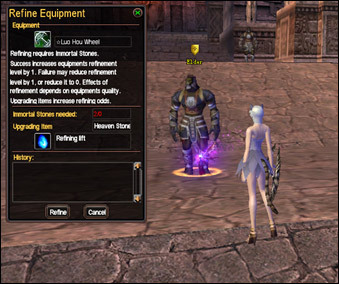 Special glows/auras appear on equipment if you 2 level 5 soul stones into a slotted equipment. The enhanced glows/trails/SFX appears the moment you attach four (4) Lv. 8 soul stones into a slotted equipment. You cannot slot higher level soul stones into lower level equipment. Always check if the lvl of the Soul Stone you are fusing is equal to or less than the slotted equipment. Also check if you are talking to the correct NPC and you have enough yuan for the fusion fee.. The easiest way to find these soul stones is by having the Alchemist NPC Upgrade/Synthesize them into higher level Soul Stones. Soul stones can be mixed and matched. It doesn't have to be the same type. Some crafting levels have level requirements or a quest.